I first read this novel years go when it was originally called Women in Black and enjoyed it. As a film version has just come out I listened to the audio book to refresh my memory and enjoyed it even more the second time around. 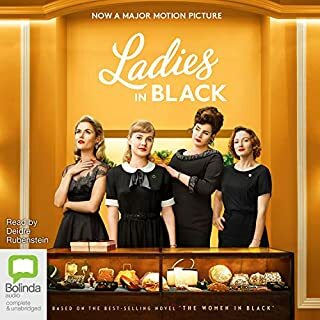 Most women will be familiar with the helpful Ladies in Black in the fashion sections of big department stores all over the world, although sadly nowadays they are a disappearing breed. If you enjoy character portraits, this could be a rewarding book for you, with wit and humour and a selection of people from differing backgrounds set in Sydney, Australia in the late 1950's. Outstanding for me were Magda and Stefan, displaced refugees from war torn Europe, getting re-settled happily in a new country, while keeping alive their own culture and group of friends. I laughed and admired Magda's virtual soliloquy as she greets and welcomes her guests, I could picture the happy chaos so well, and also later the description of all the customers and the atmosphere of the traditional January Sales. It is a beautifully written novel, the story flows, the characters are drawn perfectly, the dialogue is convincing, nothing grates and you feel empathy in different ways for each of the characters. The narration by Deirdre Rubenstein is top-notch, every character voice rings true to the writer's intent and the whole experience was pleasure. 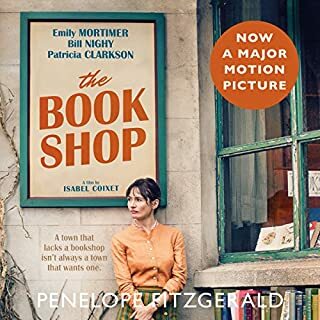 This is not my usual reading fare, but recommend it gladly to those who will take it as intended, a delightful slice of life, typical of the era and a thoughtful gentle look at a group of women and their interactions with each other over a short time in their lives. The plot was an unusual, action filled send-up of an aristocratic rakehell's Grand Tour, their bizarre adventures peppered with more good characters. Narrator Christian Coulson, captured every character's voice exactly how I would have imagined, making listening an added pleasure. 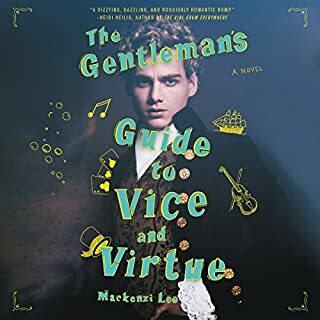 Now wishing I could hear more about the future of Monty, Percy, Felicity and Scipio so will be looking forward to reading more books by Mackenzi Lee. Disappointing end to a series that began so well and reached some rip roaring heights of fun and excitement before gradually beginning to fall apart in the last few books. Having the characters work on different plot lines all over the world and only come together to check in and play with the hounds, just did not work. May as well have been a series of separate books following just one character all the way through, because it became disjointed and continuity was lost. Granauile never seemed as realistic or interesting to me as others, whereas I definitely appreciated Owen Kennedy, he was a breath of fresh air and certainly added to enjoyment.The finale could have concentrated in getting them all together much earlier on rather than still tying up so many loose ends or introducing new characters like the Monkey God and the weird bubble tea. I appreciate the fact that the writer is a strong supporter of the environment but to beat this drum so obviously and so often in this last book didn't feel right at all. The fact that they are Druids, devoted to care of Gaia, Mother Earth herself, and explaining and showing as the various stories unfolded was sufficient. The final ending was fitting and, without spoiling, am sorry that Atticus was set up at the very beginning as the instigator of the act that rightly shocked. Of course he should be blamed, but while his impetuousness and lack of thinking about consequences is true to form and acceptable, that was out of character and no way near to the legend. As a devoted fan of Atticus and Oberon I will continue to listen again to many of the earlier adventures which can virtually stand alone. Just sad that the series ended this way. 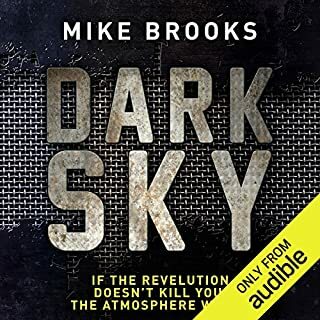 I have loved the work of Luke Daniels, narrator of every single book I listened to so far, who gave the perfect voice to each character and made them come alive. Then, Audible.com suddenly changes all it's US versions to narrator Christopher Ragland and I have no chance of getting the UK version with Luke Daniels. A very able narrator and if you now listen to all of them read by him it will be fine. But this also spoiled the last book for me as the characters did not ring true in the way I had come to know them. M is a drifter with a sharp tongue, few scruples, and limited magical ability who would prefer drinking artisanal beer to involving himself in the politics of the city. Alas, in the infinite nexus of the universe which is New York, trouble is a hard thing to avoid, and now a rivalry between the city's two queens threatens to make the Big Apple go the way of Atlantis. To stop it, M will have to call in every favor, waste every charm, and blow every spell he's ever acquired. He might even have to get out of bed before noon. 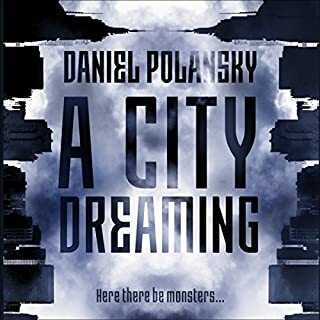 Looked forward to reading more by Daniel Polansky, after loving The Builders, and am very happy to have found A City Dreaming. This was an unusual, fascinating book and one I enjoyed from start to finish. The style is laid back, generally mellow, the prose is a pleasure and the strange, cleverly drawn character of M appealed to me from the start..
A clever mixture of magical realism and urban fantasy,.with no conventional plot line. Instead a series of chapters in the life of M, living in a New York where monsters and magical creatures mingle amongst the locals. We gradually get to know more about M's particular circle of friends, and the various tasks, adventures and pleasures shared are fascinating, weird, imaginative and non stop entertaining. M is lazy, pleasure loving, morally flexible and can be deliberately irritating, but somehow always the one who gets called if someone is in trouble, or has a problem. He has magical powers which he uses gently or harshly, depending on circumstance. M remains a mystery and that is fine by me, I don't want him analysed, just hope he is around somewhere still. other humourous happenings, but this is balanced by episodes of cruelty and horror. Only fair because any great city has it's dark, vile underside. If you are a New Yorker you will enjoy extra subtleties and nuances, but this does not make it any the less enjoyable for those of us who have only dreamed of visiting. 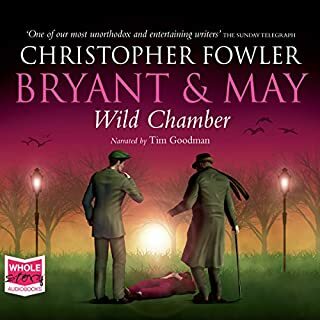 Wild Chamber, the latest Bryant and May book and as fascinating as ever in one of my favourite series. Each book can be read as a standalone but I believe for most enjoyment they are best read in order, or at least begun earlier in the series. A vast history of the Peculiar Crimes Unit and the various relationships of its' members and associates has built up over many years and adds immeasurably to the overall pleasure. Some particular comments or unexpected characters in a book as far along as number fourteen may seem strange to a new reader. A long and complex investigation here, involving several murders, but that is what we have come to expect and it didn't disappoint. I am delighted that Arthur Bryant has survived his treatment and enjoyed the way that he uses his 'hallucinations' for some apt references from the past to help his thinking fall into place. This time we also learned about the many London Parks and green spaces to add to the wealth of London lore we gain from every single book. It was also a warning to keep our attention drawn on the threat that real life developers are posing to these precious green spaces and our need to protect them. Tim Goodman as always the perfect narrator, he has portrayed every single one of the many characters become old familiar friends . Thank you, Mr Fowler,sir, you are a master craftsman and I suspect there are echoes of yourself in Arthur, although hopefully not the hoarding of food in your pockets. Long may it continue. Very happy to read Glass Houses, the latest treat in the Three Pines series of detective novels featuring Armand Gamache, his family and friends, his team at the Montreal Securite and the villagers of Three Pines. I cannot recommend these books highly enough, but do not expect fast action adventure style crime. They are clever, thoughtful, meticulously planned and the prose is a pleasure to read. The crimes addressed in these books vary between those that result from personal situations, but others recognisable as directly associated with the harsh effect of breakdowns in society or political actions in our modern world. Glass Houses deals with the unavoidable fact that police forces worldwide are losing the battle against organised crime. They face a never ending war against criminals with vast resources of power and wealth behind them, and informants and spies at every level of society. 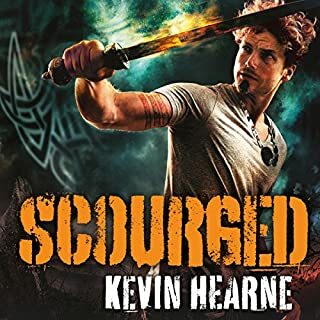 I found this book hard to put aside, because it is very tense and I was concerned for many of the characters, but it has proved one of the very best in the series. As the books progress the characters grow a little older, go through various life experiences, good, bad, funny or sad and we are drawn in effortlessly to share them and to care about them. Not caring in a sentimental way, these characters are realistic, down to earth and straight talking. They are endearing because we can find parts of ourselves in most of them, not just the best, but maybe among the scared, lonely, angry, sweary or grouchy bits. 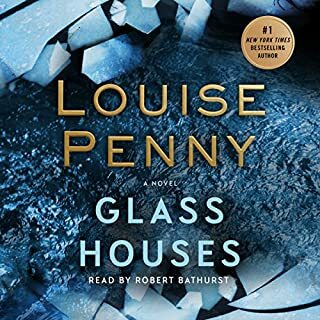 In each book Louise Penny introduces new intriguing facts about some unusual aspect such as about Canadian life, international tradition, or a particular trade to add to the general enjoyment and this book is no exception, but I will not spoiler. The narrator, Robert Bathurst is excellent. His reading is clear, conveying the essence of each character well, he adds to the pleasure of this book. For the crew of the Keiko, their stay at the Grand House casino on New Samara was supposed to be a well-deserved rest. It didn't last. Captain Ichabod Drift promised that the side trip to the mining planet Uragan would be a quick in and out - a data retrieval job then back to the tables. He was wrong. When the revolution comes, all you can do is choose a side and hope to get out alive. Thoroughly enjoyed Dark Sky, second book in the space opera series aboard the space ship Keiko. I like dour, conscienceless Ichabod Drift and his well mixed human crew, just about getting by with very dodgy but correspondingly well paid work. Naturally this leads to complications and so far they have made a quite a few enemies around the universe they operate in. Expecting these to turn up again in the future to extract revenge. All the crew have a complicated back story, some previous secrets revealed in the first book Dark Run, more coming out here in Dark Sky, but still much unknown. It is a pretty grim universe in general, with rather basic terra formed way stations between industrial planets. There are luxuries for the wealthy but everyone else out for what they can get to survive. An overriding harshly authoritarian governing body seems to be in general control, but to be honest I found this far more realistic than a future universe of sweetness and light. Despite this there is good humour among the crew and the crazy situations they land up with. Enjoyable new urban fantasy series with a private detective, Devon Sanders, enrolling secretly as a new student in a supernatural university called Quintessence. A star for that name and the M C Escheresque architecture alone. This may sound like a cross between the two Harrys, Potter and Dresden, but this book has its own original style and individuality, as well as introducing some less common fantasy creatures. Fast action, realistic dialogue, and humour as well as flashbacks for character background. I mostly dislike flashbacks so was pleased with the way these were introduced smoothly and kept brief. 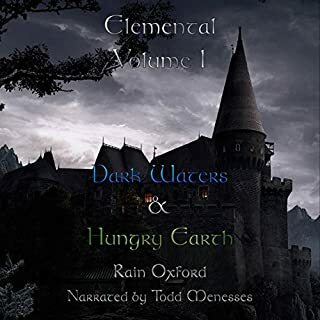 Narrator, Todd Menesses, takes a while to get used to, although is good overall. His choice of narrative style for Devon, first person narrator, is gritty and staccato, and although Devon is not young, I didn't think he was so old or jaded. General narration fine, excellent at differentiating individual characters,of which there are many. Todd does noticeably well with the female ones, who often suffer with male narrators. I am a devoted Dresden fan and did not expect to like this book as much as I did. Will definitely continue with more in the series soon. 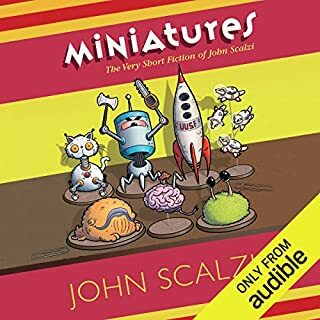 This book is short and light weight but gloriously funny, filled with John Scalzi's imagination par excellence. I laughed all the way through and was sorry when it ended. Recommended with happy laughter to brighten your day. Excellent narrators, each perfect for the particular part they read, made it even more enjoyable. Thank you Mr Scalzi.